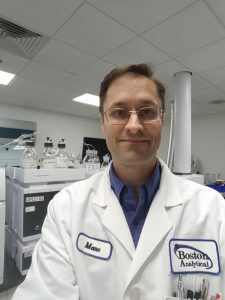 Boston Analytical’s Marc Plante, PhD, a Senior Scientist in Extractables and Leachables, will give the keynote speech at the World HPLC & Separation Techniques Conference on August 29–30, 2018 in Toronto, Canada. Marc was selected due to his work in developing new applications for charged aerosol detectors (CAD) and other work in separation techniques. Pharmaceutical methods are developed, optimized and validated at Boston Analytical using various chromatography detectors including UV, PDA, MS, RI, and FID. Marc’s expertise is with CAD, pictured here. 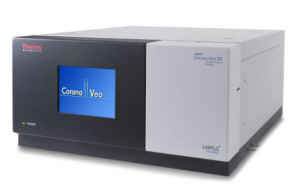 The CAD is a mass-based detector for HPLC analysis that provides a near similar response across many different analytes. The detector is especially useful for non-volatile, semi-volatile, and non-chromophoric applications such as lipids, ion chromatography, natural products, food products, pharmaceuticals, and industrial chemicals. Marc has used HPLC and CAD to develop methods for a wide variety of analytes. For example, he developed a method for the separation and measurement of lipids… of all classes. Lipids are usually measured by GC, but they have to be derivatized, and then not all of them derivatize. This means GC will not necessarily detect all lipids in a sample. Marc optimized a method to create a “Universal Lipids” method using reversed-phase HPLC and CAD. This one method was used to analyze algal oils for biodiesel production, as well as for measuring the quality of Chinese cooking oils. Another particularly challenging method Marc developed was for the quantitative analysis of organic additives used to control the quality of copper plating for today’s modern integrated circuit chips. The main challenge was working with uncharacterized analytes. Working with some basic structures for these proprietary analytes, he developed an HPLC method that incorporated the use of both electrochemical and CAD detection. Polyethylene glycol, or PEG, is one of the analytes, which breaks down over operation of the plating bath. The CAD, which had recently incorporated a linearization function, was able to measure the amount of PEG accurately with this added feature: only a linear detector could perform this measurement. This application is used successfully in the industry today. Marc says that the CAD detector is inherently nonlinear, because of how it detects analytes. The second-order polynomial typically used did not fit well with some data. He found that the best equation that fit this data was not the polynomial, but the quadratic formula. Since HPLC software did not have this as a computational option, Marc suggested exchanging the axes so the peak area was on the x-axis and the concentration was on the y-axis. This change allowed for a second-order polynomial to fit the data accurately, fixed certain calibration issues, and enabled the detector to produce a linear response. This innovative approach provided a new solution for method development of certain analytes, and it opened up new markets for the detector. If you’ll be at the World HPLC & Separation Techniques Conference, be sure to attend Marc’s keynote speech, “HPLC Method Development and Troubleshooting,” on Thursday, August 30 at 1pm.